I’m calling the controller the GRBLDuino Shield as I have plans (partially completed, too!) to design an integrated version with the Arduino built in after this is complete. I want an easy to set up, easy to use, and inexpensive product not (overly) intimidating to new users. 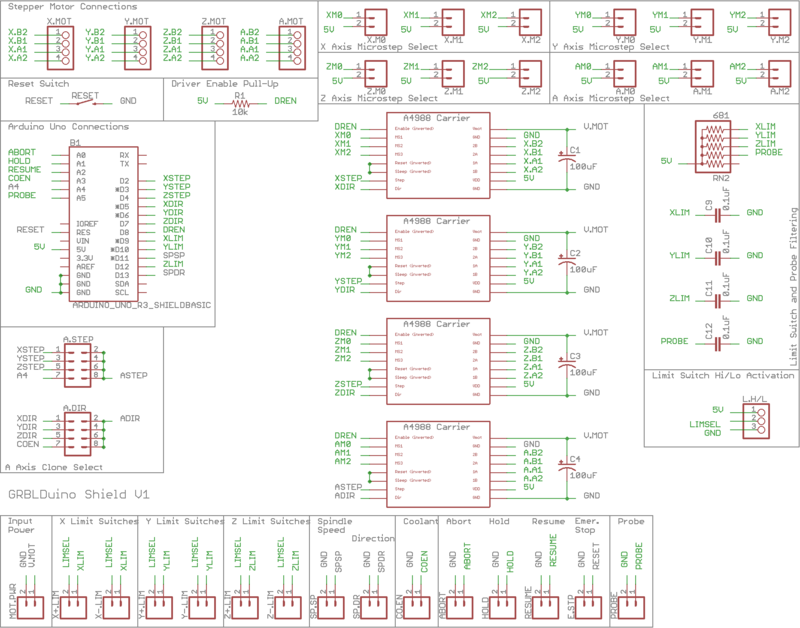 I don’t want to release this as OSHW just yet but the schematic above along with the Gerber files should allow anyone motivated enough to duplicate GRBLDuino pretty easily plus it lets you see just how much goes into one of these shields (more than I expected going in). The board layout is complete and the Gerber files have been sent off to EasyEDA/JLCPCB to produce a small batch of prototypes for testing. Boards and components have arrived, been assembled, and tested. These are now for sale through a few outlets. The best price will be at the Eccentric Workshop store, but they are on Tindie and eBay.